A new book from the Nongovernmental International Panel on Climate Change (NIPCC), titled Why Scientists Disagree about Global Warming, was released on November 30, 2015, the first day of the United Nations’ twenty-first conference of the parties (COP-21) taking place in Paris. Why Scientists Disagree, by Craig D. Idso, Robert M. Carter, and S. Fred Singer, explains why the claim of “scientific consensus” on the causes and consequences of climate change is without merit. The authors comprehensively and specifically rebut the surveys and studies used to support claims of a consensus. They then summarize evidence showing disagreement, identify four reasons why scientists disagree about global warming, and then provide a detailed survey of the physical science of global warming based on the authors’ previous work. 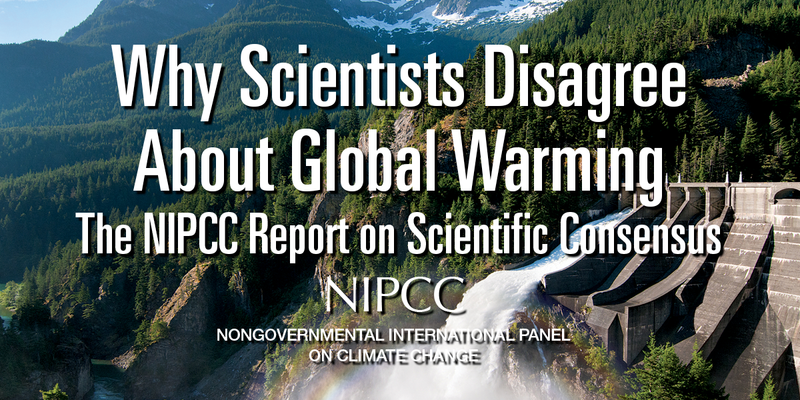 Why Scientists Disagree is the eighth publication produced by NIPCC, an international panel of nongovernment scientists and scholars who have come together to present a comprehensive, authoritative, and realistic assessment of the science and economics of global warming. Whereas the reports of the United Nations’ Intergovernmental Panel on Climate Change (IPCC) warn of a dangerous human effect on climate, NIPCC concludes the human effect is likely to be small relative to natural variability, and whatever small warming is likely to occur will produce benefits as well as costs. NIPCC is sponsored by three nonprofit organizations: the Center for the Study of Carbon Dioxide and Global Change, the Science and Environmental Policy Project (SEPP), and The Heartland Institute. This volume, like past NIPCC reports, is edited and published by the staff of The Heartland Institute, a national nonprofit research and educational organization newly relocated from Chicago to suburban Arlington Heights, Illinois. It is based on a chapter in a forthcoming much larger examination of the climate change debate to be titled Climate Change Reconsidered II: Benefits and Costs of Fossil Fuels. That volume will finish the three-volume Climate Change Reconsidered II series, totaling some 3,000 pages and reporting the findings of more than 4,000 peer-reviewed articles on climate change. A new book from the Nongovernmental International Panel on Climate Change (NIPCC), titled Why Scientists Disagree about Global Warming, was released on November 30, 2015, the first day of the United Nations’ twenty-first conference of the parties (COP-21) taking place in Paris. A second edition of the book was published and released in 2016, and distributed to 350,000 teachers, college professors, elected officials, and influential members of the media in 2017.